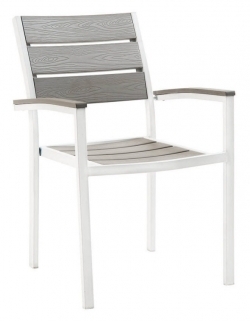 Built for the outdoors this metal patio armchair in white finish would also make a great indoor chair, especially for cafes and quick service restaurants. The plastic teaks come in a grey finish and protect the chair from outdoor elements. The chair's strong metal frame and easy to maintain finish makes it the perfect chair for a busy commercial environment. Arms make this chair extra comfortable.